On the site of what was once a huge volcano, Mother Nature has decorated Teide National Park with a weird gallery of basalt and pumice rock statues rising from a sandy plain. Sci-fi film directors have often chosen this lunar landscape to shoot spectacular movies, most notably One Million Years BC featuring Raquel Welch in a fur bikini. Rumours that the original Planet of the Apes and Star Wars were filmed in Tenerife are purely just that, rumours. 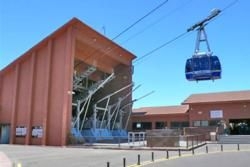 For a grandstand view, a cable car trolleys visitors up Mount Teide, Spain's highest point. From here you can see Gran Canaria, El Hierro, La Gomera and La Palma like distant whales basking in the ocean. 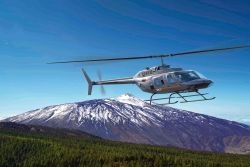 If you want to go 'one better' a helicopter tour could be just the ticket! For those with a surfeit of stamina you can avoid the dangling crowds and leg it up – albeit slowly. Allow about four hours to reach 3,555 metres, 163 short of the crater. Due to erosion concerns, to ascend the final stretch you'll need to pick up a free pass from the National Park's office in Santa Cruz (922 290129). Or click here to apply online. A number of other trails are signposted in the Park. Information and maps are available from the visitor's centre next to the Parador Hotel. Of course an easier and very enjoyable way to 'drink' in the scenery is to free wheel down on a bike... honest! 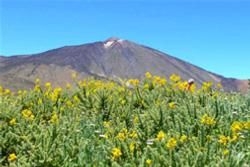 Teide is not just spectacular by day. There's a whole industry up there based on Stargazing and it is little wonder that the "Teide Sunrise" trek is one of the most popular tours on the island. Enough words for once we think...these videos tell their own story!